Which sender should I choose? The first number represents the empty Ohm reading and the second number is the full reading. My fuel gauge only reads empty. If you have a 0-30, 0-90, and 10-180 Ohm sender then most likely your sender lead wire is grounding out somewhere. Or possibly the center terminal on the sending unit itself is grounding out against the body of the car. If you have a 240-33 or 73-10 Ohm sender then the sender may not have a proper ground or there is a break in the sender lead wire. My fuel gauge only reads full. If you have a 0-30, 0-90 or 10-180 Ohm sender then the sender may not have a proper ground or there is a break in the sender lead wire. If you have a 240-33 or 73-10 Ohm sender then most likely your sender lead wire is grounding out somewhere. Or possibly the center terminal on the sending unit itself is grounding out against the body of the car. Our tanks are set up for the standard SAE 5-hole bolt pattern used by all of the aftermarket gauge manufacturers. The 5-holes are not evenly spaced. Two of the holes are farther apart than the other holes. If you are holding the sender with those two holes closest to your body, the hole directly across is known as the index hole. If the float swings to the right, it is a right-swing sender . If it swings to the left, it is a left-swing sender. Will this sender work with a 6 volt system? Yes. Your fuel gauge is simply reading a resistance to ground. Because your gauge is simply reading the amount of resistance to ground this sender will work regardless of the voltage of your car. How does a fuel sender work? Fuel senders have a rheostat that provides a resistance to ground. As the fuel arm moves from the empty to the full position a contact is moved across the board on the rheostat which varies the resistance seen by the fuel gauge. For example a 69 Camaro has a 0-90 ohm fuel sender. When the sender is at the empty position the rheostat is not creating any resistance to ground (zero ohms). When the fuel sender is in the full position the rheostat is creating 90 ohms of resistance to ground. Because the gauge is reading a resistance to ground having proper grounding of the sending unit is essential to get an accurate reading on your fuel gauge. How do I test my fuel sender? A fuel sender can be bench tested with a multimeter. With the multimeter set to the Ω setting put the red probe on the post that is the gauge lead and put the black probe on the ground post or on the body of the fuel sender. Record your readings with the fuel sender in the empty position and in the full position. Those two numbers will tell you the ohm range is of your sender. Why does my gauge read backwards? The first step would be to make sure that you have the proper ohm range fuel sender to match your gauges. For example a 73-10 ohm fuel sender would read backwards on a 0-90 ohm fuel gauge. If you find you have the correct ohm range fuel sender make sure that the float arm is installed on the correct side. The front of the rheostat shows which side the float should stick out from. If the float arm is installed on the other side the gauge will read backwards. Also if the rheostat is installed upside down the gauge will read backwards. I took my sender apart and now it doesn't work. Make sure that the bracket is in full contact with the flange. 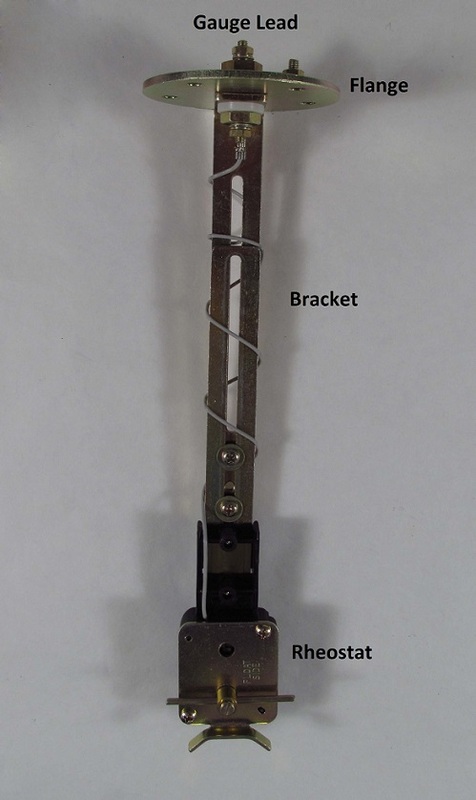 There should be full continuity between the metal strip between the rheostat and the bracket and the bracket and the flange. Make sure that the center gauge lead post is isolated from the flange and bracket. If that post is grounding out you will only see zero ohms on a gauge or multimeter.